You cannot listen to the pronunciation of tian because your browser does not support the audio element. Chinese character and stroke order animation"How do I write 天 ( tiān ) correctly?" The strokes that all Chinese characters are composed of are to be written in a certain order which has originally been defined by Chinese calligraphy. Writing all characters according to the same rules assures that their intended shape and style are generally preserved even if written by different writers. 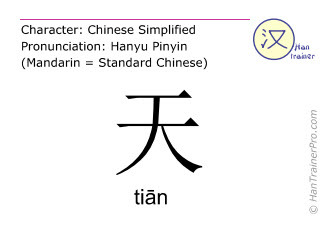 The traditional Chinese characters of tiān are identical with the modern (simplified) characters displayed above. 天 is composed of 4 strokes and therefore is of very low complexity compared to the other simplified Chinese characters (average: 13.1 strokes). We're improving and extending this Chinese-English dictionary constantly. More words and more example sentences will be added soon.